There are some software updates I'm not interested in, either because I don't use the applications involved or because I don't care. The annoying part is that they keep popping up every time there's a new update. Can't you uncheck them forever so the updates-to-ignore list doesn't keep growing? For example, I couldn't care less about stability when sending slideshows from iPhoto'11 to iDVD, something I don't do anyway. Just go up to the menu bar and hit Update>Ignore Update (or the keyboard shortcut is apparently just the delete key). Try using the command "softwareupdate --ignore" in terminal. You can first start with a "softwareupdate -l" to get the actual names of the updates (usually something like iPhoto-9.1...) and then use the ignore command to stop them from showing up. To see everything that binary can do, try running "man softwareupdate". Alternatively, you could delete the applications and Apple won't try to update them anymore. Can I hide software updates in Mavericks? How to hide app store updates in macOS Sierra? 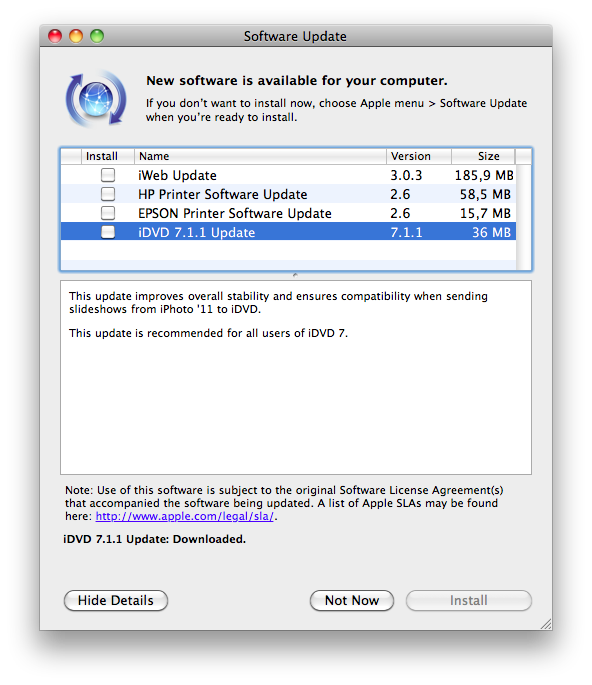 When I check for update in macOS, are the software from other sources checked for updates as well?